A tale of the heroism during World War II includes a spectacular Tallahassee native. Tom Van Brunt’s Tallahassee roots run deep. He was born into one of Tallahassee’s oldest and most distinguished families. But nothing in his small-town upbringing prepared him for the death-defying experiences he encountered as a Navy fighter pilot based in the Pacific during World War II. Tom’s parents had three boys. The two older brothers, Bill and Tom, enlisted in the Navy in September 1941, three months before Pearl Harbor. Their younger brother, Bernard, enlisted in the Navy upon his graduation from high school. 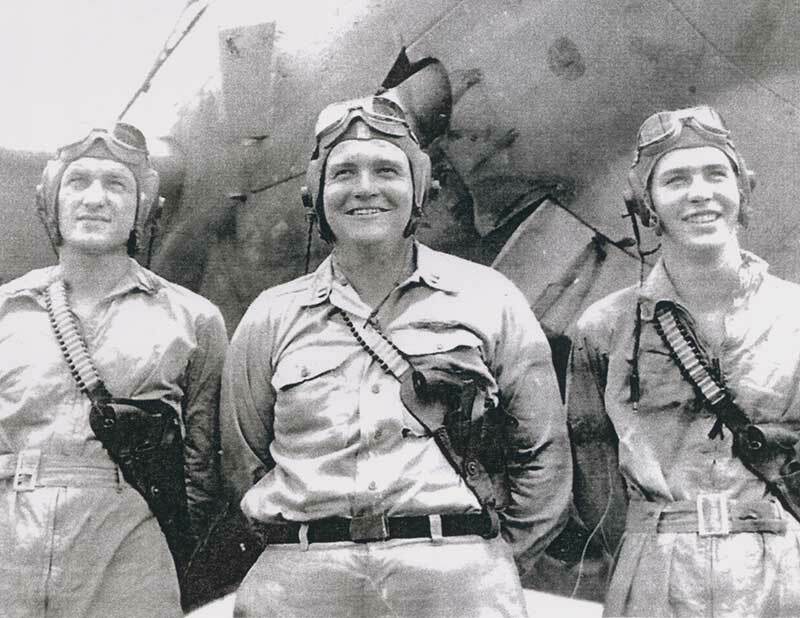 All three served in the Southwest Pacific. In October 1944, the largest naval engagement of World War II turned the tide of the war in the Pacific. A total of 264 combat ships took part in the Battle for Leyte Gulf. The Japanese lost 26 large ships, while American forces lost three small carriers and four destroyers. Lt. Tom Van Brunt had been assigned to fly an anti-submarine patrol in the sector northeast of the carrier group to which he belonged. The pilot and his two-man crew took off just before daylight during a heavy squall. Van Brunt’s fellow pilot, Ensign Bill Brooks, had the northwest quadrant. “Are you sure they are Japanese?” replied Derby Base. At that moment, Derby Base became convinced because the Japanese launched their first salvo into the midst of the Allied carriers. After flying the sector for about an hour, Van Brunt heard an all-fleet order from the admiral for all planes to attack with whatever arms they had, and for all carriers to launch whatever planes they had. Van Brunt’s plane had three depth charges aboard for attacking submarines, but no subs had been seen. He figured if he could place the depth charges close enough to a cruiser, he might be able to do some underwater damage. There was cloud between Van Brunt and a cruiser below and when he came out of the cloud, he found that he had made his dive a little too shallow. Now without any ammunition and low on fuel, Van Brunt flew back to his carrier to find it under attack. Unable to land on his ship, he found another carrier, the USS Marcus Island, upon which he landed safely. When they climbed into their planes, Van Brunt’s was the first on the catapult. They had to launch crosswind because the enemy was directly upwind, preventing a normal carrier takeoff. The plane was loaded so heavily that Van Brunt and his crew were not sure it would fly. Van Brunt’s plane climbed slowly to rendezvous height and was joined by eight fighter planes from another carrier. As the leader, Van Brunt made the decision to attack a Kongo-class battleship, which was last in the Japanese line. They headed directly toward the battleship and dropped their torpedoes. Then, Van Brunt felt his left rudder go limp. His plane has been hit by enemy fire, setting in motion a series of near miracles that make Van Brunt’s story one of the most remarkable in all of Navy aviation. As he climbed back to altitude, Van Brunt found that he could handle a right-hand turn pretty well. When he got back to the St. Lo, he asked the signal officer for permission to come in from a right-hand approach, which is never done in a carrier landing. Van Brunt continued circling at 1,500 feet and watched the other planes land. That plane pulled up and nosed over into the flight deck. It went through the flight deck into the hangar deck, where the planes were being armed and fueled. That’s where the explosion occurred. Twenty-five minutes later, the ship sank. Van Brunt was told by radio to proceed to the airstrip at DULAG. A right-hand approach was unusual, and when some of the American troops on the ground saw it, they opened fire with small arms, thinking it must be the enemy because all of the other Navy planes were approaching in left-hand turns. As far as Van Brunt could tell, his plane was not hit, at least not to the degree of being disabled. The plane dodged bomb craters on the grass runway and landed safely. The first thing Van Brunt and his crew did after alighting from the planes was to inspect the damage. Enemy anti-aircraft fire had hit the very rear of the plane’s fuselage, severing the left rudder. They also found that their tailhook had been shot off completely. That meant that if they had landed on the carrier, there would have been no way to stop the plane — and they would have crashed into the barrier on the flight deck. This story first appeared in the November/December 2005 issue of Tallahassee Magazine. Tom Van Brunt died in January 2008 at age 90. The author, former FSU President J. Stanley Marshall, died in 2014 at the age of 91.